American Optical was acquired by the Scovill company in 1867 and acted as primary camera maker for Scovill. American Optical and Scovill offered many similar cameras. While Scovill cameras were less expensive and made for a growing amateur market, American Optical's apparatus was more costly, being constructed of finer woods with a higher quality finish. This particular view camera is a 5 x 7 format and identical to Scovill's St. Louis Reversible Back Camera (refer to the St. Louis Reversible Back Camera Reference page). It is a front focusing, cone bellows design that incorporates Flammang's patent hinges and single swing back. 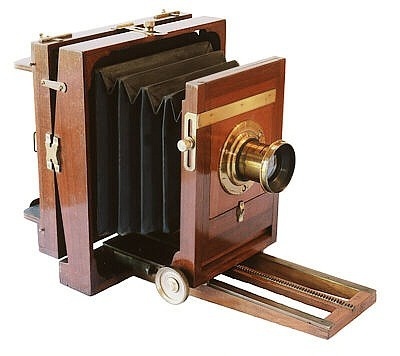 As a note, the revolving back version of this camera was available as Flammang's Patent Revolving Back Camera. The American Optical Company may have updated and renamed the St. Louis camera as the Star View Camera in 1890. A scarce Steinheil Group Antiplanet lens is mounted; an asymmetrical formula patented in 1881 by H.A. Steinheil to fix a specific aberration characteristic of symmetrical designs. The lens bears US Patent No. 241437 (May 10th '81) indicating that is was manufactured for export to the United States. sold for $32 in 1888 (about $607 in year 2000 dollars). American Optical Company, Scovill Mfg. Co., NY.